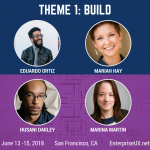 Our BUILD theme, one of Enterprise UX’s four “mini-conferences,” focuses on the ideating, sketching, modeling, and prototyping necessary to develop effective and flexible enterprise processes, products, and strategies. Whether you balance legacy and strategy, work in regulated environments, or adapt a design process to suit a different product cycle, BUILD addresses the pragmatic aspects of designing within and for the enterprise. If you’re struggling to build new technology in the midst of legacy systems, you’ll find our BUILD theme at Enterprise UX 2018 particularly relevant. Get a taste of what we’ll cover in this short podcast interview with Eduardo Ortiz—or just go ahead and register for Enterprise UX.